Eastern Europe is dragging down the EU more so than any US housing crisis. This may be a more important issue to watch for most currency investors because there are structural barriers that will not allow a fix to occur. First, it is difficult for the EU to solve or provide leadership for this crisis given the continued problems with EU countries. The EU was not structured to handle problems of coordination across regions which will require financing from countries that already have funding problems. Second, there are limit to what can be done within each Eastern European country since they are having internal fiscal crises. Third, the banking system which should be the mechanism for a solution is strained with EU loans problems. Four, large non-local liabilities within these countries is placing significant strain on Eastern and Western Europe. Many Eastern loans were financed in euros or Swiss francs under the assumption that there would be a continued tight link between these currencies and the West. In the case of the case of the Swiss franc, Eastern currencies have declined beyond 30%. This increases the default probabilities on the loans. Poor economic trends will continue because there is no quick solution to the problem except for devaluation of the currencies and an abandonment of the any thought of entering the EU. Currencies will have to adjust significantly and stay at lower levels. There will be no easy fix because even if goods can become competitive with lower exchange rates, there is still a problem of the external debt repayment which cannot be solved. Much of the loan portfolio will be turning over in the next year so there will not be financing available to roll the debt at current exchange rates. Watch for the bottom to fall-out. Niall Fergusen, the popular historian, has started to call the economic combination between US and China, Chimerica. Hillary Clinton reinforced this concept when she spoke in Beijing, stating that China needs to buy US Treasuries in order help the US and to revive exports to the failing US economy. With the fall-off in exports, China needs a robust US economy. The US needs capital to help bail-out the banks and create growth. 3.whether internal Chinese growth can keep funds in China without a disruption of the banking system. The new order for ending global imbalances called by for the IMF will not change if two major players continue to deal under the current global disorder. Short-run economics are taking a backseat to long-term imbalances. There has been so much talk about the current crisis and the potential for it being the worst since the Great Depression that there has been little voice as to the number of crisis across the globe in the last century. The chance of a crisis should not just be measured by what has happened in the US but relative to what has occurred across many countries. To look at only events in the US is egocentric as if the rules of the rest of the world do not apply to this country. It also does not allow a clear analysis of what is the potential for downside economic events. Albeit crises are rare, they are not “Black Swans” with infinitesimal probability. These issues have been addressed in a number of research papers by Robert Barro, most recently with a piece focused on macroeconomic crises since 1870. Looking at both consumption and GDP over the last 100 plus years, he found 95 consumption crises in 29 countries and 152 GDP crises in 36 countries. A crisis is a cumulative decline of at least 10%. The worst crises were as expected World War I and World War II followed by the Great Depression, the 1920 influenza slowdown, the LATAM debt crisis and the Asian crisis. The problems are greater for non-OECD countries and have been worse before WW II, but almost every country is likely to have a crisis. The probabilities while small are certainly greater than 1% and the severity may be quite large. Most of these crises last for years and do not have a quick solution. Barro does not talk about the policy implications of this work but has focused on the fact that rare events of large magnitude do occur helps explain the large equity premium in stock markets. The risks have been priced in the market. Perhaps one of the largest reasons for the current crisis has been the complacency of investors who got used to the period of the Great Moderation. This complacency caused greater risk seeking behavior which lead to higher leverage and larger loses once a crisis did occur. This may not help us exit the problem, but it will shape our future behavior if we are better aware of low probability risks. Spreads on EU bonds have widened significantly which means the market is pricing in greater credit greater differentiation across countries. Sovereign risk exists because the ability for each country to finance debt has greater uncertainty.While there is a single currency, there is no single fiscal policy and no monolithic economic behavior across the economies. Productivity is different. Taxes are different. Cost structures are different. While it may have been possible for countries to agree on a common bond when the risk differences were minimal, it is almost impossible for it to occur when there are wide spread differences. Germany would have to be willing to increase their funding costs to the average across the EU. The burden of payment would also fall on those which have the best economies at this point. The strong EU countries would be bailing out the weak. Yet, there are limited choices because all of the credit risky countries do not have any monetary tools available to them. The ECB is not structured to handle risks like this in the EU. The result is that the euro has been a weak currency because EU policy coordinated is limited by the government structure in place. When you work in finance, you believe the world revolves around your industry. Not true. The Innovation and entrepreneurship portion of the knowledge@wharton website lists the top 30 innovations of the last 30 years. For all that has been negative concerning what some would call a period of excess, we have had some impressive achievements Think what your live would be like without those 30 innovations. Perhaps I am biased but I would include the movement to global capitalism and trade. Trade is nothing new but think about the world of 1978 versus the integrated world of today. Without trade, these achievements would not have spread to all parts of the globe. Gold has usually been viewed as a hedge against inflation yet we are seeing gold spike up since last October even while deflation fears have increased and inflation number have been on the decline. Now gold could be rising under the view that higher inflation is around the corner, but there is little to suggest that inflation will be increasing in 2009 in current numbers. The cost of gold storage has declined with interest rates approaching zero so the penalty for holding gold while you wait for inflation is less. The expectation for inflation from a longer horizon can be embedded in gold prices given the low cost. We think that gold is now actually being a surrogate for sovereign credit risk. This is goes back to the old story that gold is an alternative store of value but with a different twist. This alternative store of value story would be that if all countries become riskier than all currencies have the potential for being debased. Now a currency price is a relative price between two monies but if you do not know which currency will be less risky you may choose to store value in another alternative asset, gold. Does this story fit the facts. A simple analysis suggests that it does. First, the price of gold increases dramatically during the first wave of the crisis in August 2007. This continued until March 2008 when the Bear Stearns bail-out occurred. Gold prices actually fell during the big oil run-up in the Spring and summer of 2008. While other commodities continued to fall, gold prices rose first with the AIG and Lehman problem and then with the talk of further country risk from fiscal crises. Gold has increased with the increase in default risk across countries. In fact, the correlation with sovereign risk has been very high more so than any measure of current inflation. Gold has also moved with expected inflation embedded in the difference between nominal and TIPS bonds, yet general riskiness across currencies based on sovereign risk may be a better measure. After we hear from Treasury secretary Geithner that the Chinese are believed to be currency manipulators it was going to be interesting to see what the reaction would be from the G7. They have encouraged the Chinese to appreciate their currency. Well, the wording was actually softer this time with the G7 welcoming the fiscal stimulus from the Chinese with the expectation that the currency will appreciate. This was a softer tone that what has been used in the past. This tone may actually help avert a stepping-up of the rhetoric concerning currency rates. the focus seems to be on eliminating extreme currency volatility which is where the policy focus should be. It is imperative that the G7 tries to work as a unified front to continue free trade and open capital markets even though the natural tendency is for protectionism. The costs of a Smoot-Hawley tariff war are too great. Treasury secretary Geithner went to the G7 policy meetings in Rome and got a less than hero's welcome. You would think that all of the other finance ministers would be happy with the great US stimulus package and the fact that Treasury is working on a great new bail-out package. Unfortunately, this group has become a sceptical lot. There is actually concern that crowding out will occur. This will be a growing problem because the world economies will be fighting for a lower level of credit expansion as the financial markets delever. Yes, there will be expansion from the central banks but there is the realization that dollars going to better America may not going to some other country. All of the G7 will be running large deficits and fighting for cash. The US problem of running deficits is not going to go away. Savings will increase on private basis only to be replaced with dissavings on a public basis. There can be fighting for world trade through protectionist measures but we may also see a fight for world credit. Just like capital flows have become a bigger driver in markets, protectionist policies for capital may become the new form of protectionism. 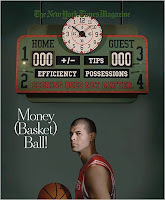 The Sunday NYT magazine has a a great article by Michael Lewis on Shane Battier, the former Duke basketball player who is currently playing with the Houston Rockets. The focus by Lewis is on the no-stat all-star who is able to make the team better even when there is no tangible numbers which we usually associate with superstars, or more importantly, there are no readily available measures or stats for someone like Battier. This is a new version of his sports work on Moneyball which discussed the use of new stats for measuring undervalued baseball players. He did a similar analysis with Blindside, the story of changes and inefficiencies in football. Once again Lewis looks at the changing landscape of a sport, this time the NBA. There is now a greater need for team and role players when there is a shortage of money after you pay your two superstars. How do you find the player that can make the team better? how can you measure the success of this type of player. The team player may not be measured through points scored, rebounds, or assists yet there may be intangibles that are valuable to winning. There is also the problem that players respond to incentives, so they will play to increase individual stats because that is how they are compensated and not always help the team win. If the incentives are changes or if you can measure the intangibles, you can exploit an inefficiency and change behavior. Here Battier is a player who does not generate normal stats but can do a great job of making the team better. New stats have been developed to measure team productivity. Numbers can be used to find these inefficiencies. This can be turned back to the investment world through the search for inefficiency and new measures for value. The markets are dynamic and have to learn to adjust to find new ways to create value. Sports and markets follow the same behavior. The number one lesson for Treasury and for the government at this time is that there is a risk premium associated with policy uncertainty. The market was not so upset by the fact that there were limited details about the new TARP or Financial Stability Pact (FSP) as much as there is still uncertainty on the form of the policy. Uncertain policies mean the potential for harmful policies. Of course, the policy plan could be market positive but without details it is better to hedge. If there is a delay in policy details it sends the signal that the government is not sure of the course of action and that there is not agreement on what should be done. This means that the political process may results in a poorer outcome. Of course announcing a plan does not ensure there is no policy uncertainty. You can easily have an announcement followed with a change in the policy. There is then a loss of credibility. The government cannot be trusted to follow-through on a specific plan. The policy came is fairly simple, under-promise, over-deliver, mean what you say and follow-through to the best of your ability. You may still be wrong but the market impact may be minimized. Of the maxims of orthodox finance none, surely, is more anti-social than the fetish of liquidity, the doctrine that it is a positive virtue on the part of investment institutions to concentrate their resources upon the holding of ‘liquid’ securities. It forgets that there is no such thing as liquidity of investment for the community as a whole. Keynes in the General Theory speaking about liquidity. In all of his talk about the liquidity and credit crisis, reflecting on comments by Keynes is useful. Everyone cannot have liquidity at the same time especially if everyone starts to grow the same conclusions about an investment. There need to be differences of opinion and enough diversity so that markets will have two-way flow. Global markets will never have liquidity for everyone. The Fed has cut rates to near zero and has engaged in credit easing techniques. The Bank of Japan is now willing to again buy stocks from banks and is informally engaging in a quantitative monetary program. That being said the money stock in Japan has been growing by less than 1% for M3 and just under 2% for M2. The Bank of England has been approved to move to a quantitative easing program and has again cut rates last week down to 1%, but the ECB has continued to go slow with cuts and has actually stated that it believes there are drawbacks with quantitative easing. Sticking to your principles is a laudable but dangerous during this period of weak economic performance. Yes, the ECB has actually been keeping their fund rate below their target levels but the slowdown in the EU is as bad as anything seen in other regions. The ECB is arguing that because they have stickier prices there is less chance for deflation so they can keep rate higher than in the US. However, the ECB has accepted a wide range of collateral for lending and has increased its balance sheet by over 55% in the last year. The Fed on the other hand has increased its balance sheet by over 200%. The ECB has also lowered the rate on deposits held at the bank so as provide incentives for banks to lend. The Fed pays the Fed funds rate on deposits which is much higher than in the past when there was a penalty rate. Even some in the ECB have stated that they question the wisdom of current Fed policy. This divergance in opinions will be the key driver for exchnage rates in 2009 because it will be the key macro differentiator across the two regions. 2009 will be an important regulatory turning point not because there will be more regulation but because there is the potential for a fundamental change in the philosophy for how regulation should be implemented. There may be significant move from principles-based regulation back to a rules-based system. The old system of rule stifled innovation because action and behavior was set in stone by the regulator. Rules are promulgated. The industry responses in testimony or letters and then the administrative regulations are enacted. There is clarity with rules but it does not allow for much flexibility. The principle based system allows for concepts of good practices to be developed and the industry has the chance to develop what is the best approach given their knowledge. This is the approach that has been taken in England and Europe. There will be mistakes like a rules based system, but it also allows for more adaptation to change and innovation. There are still rules but not as heavy hand from the regulator. One hopes that the CFTC will be allowed to continue to develop a principle based system. It has been generally effective for a number of years for exchange traded products and should be allowed to continue. CBO forecasts tell an interesting tale. The comments are coming in from the President hat if the Congressional stimulus package is not passed there will be a catastrophe. There is a significant focus on the packages as if there is no other solution and this is the only way out of the crisis. Is fiscal policy needed to help at this time? Absolutely. There needs to be a change in investor and consumer behavior, and the use of government spending and tax changes can help when there is a fall-off in private spending; nevertheless, the type of policy and size will matter deeply. The Congressional Budget Office is a nonpartisan group which advises Congress on fiscal and economic matters. It serves as an economic consultants to the Congress to provide independent insight on the economic impact of legislation and budget matters. The CBO has provided extensive analysis of the economic impact of HR1 but there is a question whether anyone is reading this work, or if anyone is going to take their comments to heart. If the CBO is a doctor giving advice on a sick economy and what is necessary to get healthy, the patient is not listening. The American people may not enough know of the CBO findings. By CBO estimates of the $850 billion in the House Bill only $132 billion will be used in the remainder of fiscal 2009. $242 billion in 2010 and $145 billion in 2011 in new spending. This will total over $600 billion in new spending over the next to years. There will be a decrease in revenues of over $200 billion in the nex ten years from chnages in the tax code. This will not have an immediate impact on the economy. The guarantes and changes in TARP may have a more immediate impact. So if anyone thinks we are front loading the expenditures, the answer is no. Congress knows this. Does the American people? The CBO forecasts that the House plan will have a long-term negative effect on the economy. No plan could be better than this plan in the longer run. Congress knows that, but do the people? Now in the long-run we are all dead, so who cares but if you care about the next generation or “the children” then there has to be more careful analysis. The CBO states that the impact of crowding out of private investment from higher interest rates will have a significant negative impact. Now they provide a lot of assumptions and caveats but does not this require more discussion? We are already seeing what the bond markets think, and it is not positive. Yields are rising and it is not because the economy is doing better. Michael Heller has written one of the most interesting economics books of the last year. It is a thought provoking and well written account of the anti-commons problem that has not been clearly focused on by many economists but which has a profound impact on how the US may grow in the 21st century. An important concept in public economics is the “failure of the commons”. When there is public use or open access of land, fishing areas, or other non-private spaces or activities, there will be overuse and the free-rider problem. For example, if no one owns a fishing area, then no one has an incentive to manage the areas effectively for renewable. Everyone will fish to the maximum under the assumption that everyone else will try to maximize their catch. No one has the incentive to keep up the common property. There is overuse of the resource. In his book, Heller focuses on the opposite problem of underuse through the “tragedy of the anti-commons”. When there is too much private ownership or if there is private ownership that is just a small portion of a total, there is the potential for what he calls phantom tollbooths. Too much diversification will lead to too many costs and underuse of property. The simple examples can include the use of patents to block the usage of certain technology. It could be the licensing of telecommunication bands into small regions which makes a national system difficult to implement. It could be NIMBY (not in my backyard) behavior which stops development of useful public works. It can come in the form of a single hold-out in development. It can also be a morass of regulations which create banana republic behavior within government which creates deadweight costs. This book focuses on this problem because many are not aware of it. He also offers some simple solutions. If we have a chance to focus on change, this would seem to be an area where fresh thinking can have a significant impact on the economy without high financial costs. One hopes that this is the change that some have in mind for the next few years. 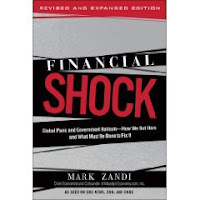 Mark Zandi, the chief economist for Moody’s economy.com, provides a good simple book on the subprime debt crisis. It is an excellent primer for anyone interested in how we got into this mess. Zandi explains the crisis in historical context and through the different perspectives of the multiple players responsible for the implosion. Most telling is that there is no single villain in this crisis. There is enough greed to go around for everyone. There is enough shifting of responsibility and incompetence to suggest that just turning this over to regulation may not be the solution. 1. Adopt a mortgage writedown plan. This should have been the objective of TARP but was missed in the Fall. 2. Establish mortgage lending rules. We have yet to see an overhaul here. 3. License mortgage brokers. Again a significant need for the industry to provide some trust that the system will work. 4. Expand data collection on mortgages. This is always the last thing that money is spent on, yet this provides the basis for any discussion. If we do not have data on the problem, we cannot form solutions. 5. Reform foreclosure process. There is no national method for handling foreclosure so there is the potential for a patchwork of solutions on a state by state basis. This is a major problem for investors in MBS. 6. Invest in financial literacy. It is necessary for consumers to know what they are signing and for contracts to be made in plain English. The buyers should know what he is signing through good clear examples. Financial literacy should become part of school programs. 7. Modify mark to market accounting. What is the value of the mortgages held on the books of banks? We do not know yet we have imposed the idea that we can determine fair value. There has to be a new set of rules so that firms will not be driven into insolvency based on short-term liquidity crises. 8. Overhaul financial regulation. This will be coming, but there is no clear idea what will be best for the market. It is not clear that a single super agency will solve the problems. 9. Pay attention to asset bubbles. The Fed under Greenspan believed that the central bank should not be involved with identifying or stopping financial bubbles until after the fact. This now seems like short-sighted approach. The Fed had a number of tools that could have been used to slow the mortgages crisis and none of them were employed. We look forward to Zandi using his clear language to help the regulatory debate. How are we going to fund this debt?